David Oyelowo and Rosamund Pike have strikingly similar career trajectories. Both England-born actors started out in television in the late ’90s before jumping to feature films in the early-to-mid ’00s, and they both had overdue breakout roles in 2014: She as the title character in Gone Girl, he as Martin Luther King Jr. in Selma (only one of them was Oscar-nominated, but they both deserved it). Perhaps it’s this common ground that helps to make them so convincing as kindred spirits in A United Kingdom. The real-life characters they’re playing have less in common, at least on the surface. Pike is Ruth Williams, a Londoner who works in an office by day and occasionally accompanies her sister Muriel (Laura Carmichael) to local dances at night. That’s where she meets Seretse Khama (Oyelowo). After a pleasant first date, she finds out that Khama is a prince of Bechuanaland (now Botswana), attending school in London before returning to Africa to assume rule of his tribe in cooperation with the British government. They feel an immediate connection, and when Khama and Williams decide to get married, the Brits and the apartheid-upholding South African government join forces to object to the interracial union. 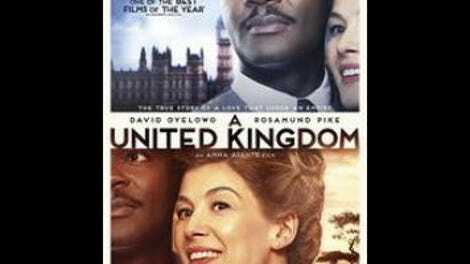 A United Kingdom chronicles the difficulties that ensue when several governments are publicly and vociferously opposed to the simple fact of two people making each other happy. That early happiness radiates from the two leads; this may be a historical drama, but Oyelowo and Pike are ready for a glossy movie-star romance, should the opportunity present itself. The courtship of the embattled couple—dancing, talking walks, trading jazz records like mixtapes—immediately establishes their rapport. But the way director Amma Asante (Belle) assembles her images doesn’t always match their individual power. Amidst beautiful shots of Oyelowo and Pike on foggy London streets and in front of a gorgeous African sunset, there are unnecessary mid-conversation dissolves, abrupt fades, and quietly excessive cuts that manage to make some dialogue scenes less visually interesting, rather than more. In a later scene in the halls of British parliament, Asante toggles back and forth across the 180-degree line, repositioning her actors in the scene, creating disorientation in a moment where none of the characters seem disoriented. There are pieces of something lovelier and more graceful here, scattered by the direction. The bumpy editing may be a byproduct of the movie’s need to cover considerable historical ground. Eventually, romance gives way to procedure, as the depth of the governments’ obstructionism becomes clear. (This is the rare movie where an unseen Winston Churchill is cast as a duplicitous betrayer.) Khama and Williams are separated for long periods, and while their circumstances are infuriating, Asante and her screenwriter Guy Hibbert don’t always find ways to dramatize them in interesting ways. There are a lot of conversations where thinly drawn supporting characters express disappointment, anger, or, in the case of the British (including an owly Tom Felton), officious disdain over the union. The leads do what they can. Oyelowo, in particular, feels like a secret weapon; as in Selma, he summons a forceful presence, particularly when speaking to a crowd. Neither he nor Pike ascends into the heights of overacting, staying well-matched for the entire film. In one of Asante’s more powerful moments, she cross-cuts between parallel dressings-down received by both husband and wife, delivered by a system that wants them subservient and pliable. A United Kingdom sometimes resembles an international version of Loving, and the obligatory treatment of real-life events like pregnancy or betrayal by the British government deepens appreciation for how much patient observing Jeff Nichols was able to do in that quiet, underplayed movie. 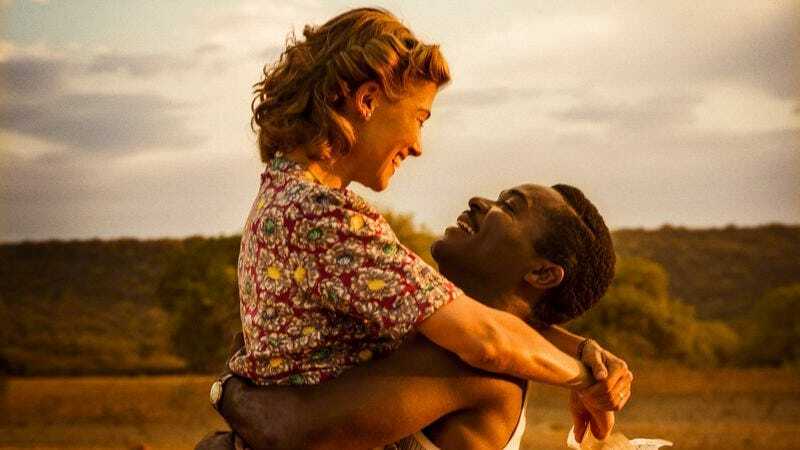 Like Loving, A United Kingdom has plenty of moments that will resonate for a contemporary audience: “Not everyone agrees with what the government does on their behalf,” one character muses regarding the British and South African attempts to “protect” Bechuanaland. (Though it wasn’t written with the current administration in mind, in the movie it practically plays like an applause line). But the movie falls short of delivering a memorable experience of its own. Outside of confirming its stars’ presence, A United Kingdom is more valuable as history than filmmaking.